Can you add a 3D cutaway feature displaying the procedural planet's core, mantle, and the crust and the individual composition of each layers. Planetary interiors are not currently modeled, so it would be impossible. HarbingerDawn, Yes indeed, If you active "noclip mode" you will find the interiors of planets to be empty. However, it is possible to make something similar by hand. Is this overlapping multiple planets? Sounds cool!! Is this overlapping multiple planets? I think it would be possible to do it with nested planet, but in this case, these are layers of clouds with a negative height. I think it depends on how big is the mass iof this world. 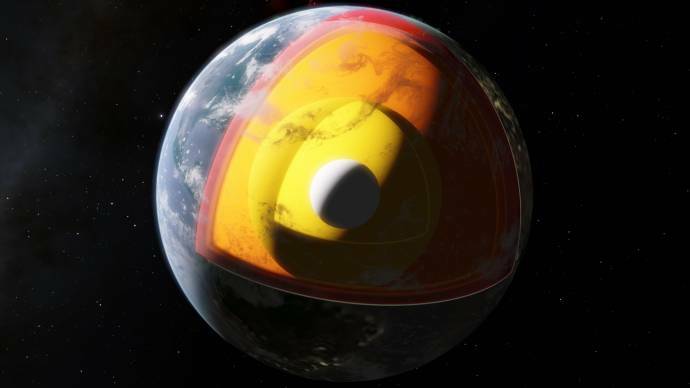 If it is large enough so that the world has a hot core and submarine volcanism, - like the earth at the time of the "Snowball Earth" - then there can be life. Otherwise it would now probably be no life on Earth. So does this mean that small ice giants around older stars will likely look like Uranus and that the inert atmosphere won't be selected at random like rings are? I'm certainly not an expert, but if you could take the time to look at the pictures (or visit the black hole in-game) and tell me if I'm right or wrong about this being a bug, I'd really appreciate it. I think my most compelling argument for it being a bug is the fact that it used to be smaller in previous versions. The next patch will have limitation for black hole size, so it no longer this big (just 200 AU). I also added limit for star orbit pericenter distance based also on BH event horizon size, not only on Roche limit (large black holes can have so weak gravity on their event horizons, so even stars can cross it and not being destroyed by tidal forces). Very nice! May I also suggest adding crater chains if they aren't too difficult to add? Seconded! Radially from impact craters, of course (that's how crater chains arise, right? Ejecta from an impact?). No, they are formed by comet chain - debris of a comet disrupted by planet's tidal forces. Some of them: Ida, Sylvia and some others. Do these inert Jovian worlds have age/size correlations to them? Uranus from what I understand is inert currently due to the smaller size and losing internal heat over time which is why Uranus lacks the banded clouds the other Jovian have. Uranus is not inert. It just have frozen ammonia fog layer what hides clouds behind it. The same for Neptune and less for Saturn. This depend on chemical composition of planetary atmosphere and on it's average temperature. And for that matter, to what extent are surface features defined by correlations to their location and relationships to other worlds? For some features - yes, for others - not yet. Hello! I have reinstalled Space Engine, Hardly any problems. But Earth is completely white and rendered incorrectly. If you have a solution to the problem, please inform me! Thank you! Did you install it properly? You must install 0.9.7.2, then install 0.9.7.3 on top of that, then install 0.9.7.4 on top of that. If you didn't install the patches on top of 0.9.7.2 then this happens. Exactly what I did. I installed 0.9.7.2, opened it so it could get it's files, then closed it and deleted the cache files. I repeated with 0.9.7.3 then I installed 0.9.7.4 but didn't delete any files. I did after 0.9.7.3. But did you install that INTO the 0.9.7.2 folder, or into a separate folder? As you can see, once the start screen is brought up, the smaller binary star becomes a black circle(as shown in the red circle above). I was only able to replicate the bug in binary systems where one star is much larger than its companion(red giant-main sequence star pairs). In other binary systems, the problem isn't present. I have the same problems too sometimes. Happens to me when I go to kerbol in the kerbal mod. I installed each into the same folder and replaced the files asked to replace. Strange. There's no reason it shouldn't work properly, unless you modified some files. Post your log file.